Auslogics Browser Care is a program which was apparently created to improve Internet browser experience by providing a way to control how different browsers act. Currently, it supports Internet Explorer, Google Chrome and Mozilla Firefox. One interesting feature offered by Auslogics Browser Care is the fact it can keep tract of your homepage and search settings. These are often changed by adware or program installers and can become annoying having to swap back to preferred homepage and search engine. Version 5.0.24.0 is a freeware program which does not have restrictions and it's free so it doesn't cost anything. For security reasons, you should also check out the Auslogics Browser Care download at LO4D.com which includes virus and malware tests. Additional screenshots of this application download may be available, too. 4.5 out of 5 based on 65 ratings. 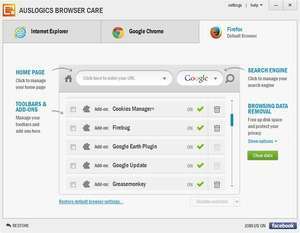 Auslogics Browser Care download been highly rated by our users.